Garden furniture reminds one of cool summer drinks to be served. I grew up with porch swings and those vintage brightly-colored metal chairs. Later, we got a metal glider, which was nice. But the swing always was my favorite. You could put your legs up on it, put a pillow behind you, and read a book. Thanks for sharing the link to the glider photo. It brings back wonderful memories. My grandmother had a glider on her porch that she used to often sit on on hot summer days. I am envious too of beautiful patios or decks! Before my husband passed away we put in a new deck! It needs beautiful furniture now. The only drawback is that my deck is so visible to everyone that goes down our street! I need to get creative to make it private! Plants! When you come up with a solution you’ll have to do a blog post on it. Getting creative with plants to make your deck more private sounds like a fun project. I never thought about people having nice lawn furniture a hundred years ago and can’t really think of anyone having it growing up. I guess I can picture porch furniture with swings and wicker. We had a couple Adirondack chairs and a swing on our porch when I was a child. 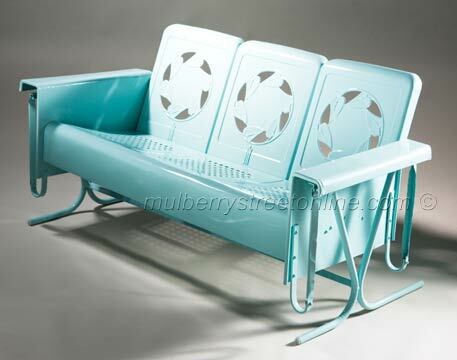 I still remember my grandparents rockers and my parents iron chairs that sat outside during all my growing up years. Wish I still had them! People spent so much more time on their porches in days gone by. I can remember wonderful evenings sitting on the porch with family at the end of long summer days. This entry reminds me that we need to upgrade our pillows and the yard furniture with a good wash will look sparklingly new. It sounds like you have a project ahead of you. I always find it frustrating that lawn furniture pillows and cushions don’t look “new” for very long. “Comfortable thrill” is kind of funny. I’m like you, I’d love to have all that fancy lawn furniture they make. Guess I’ll just enjoy it via Pinterest. Ha. Ooooo!! Great idea! I’ll bring the cookies! I must be getting old, too. 🙂 They look like something that might have been nice for a party – but not very practical for everyday use. I’m always glad when I find folks who like me, appreciate the old time “stuff” and way of living. I agree! It’s so wonderful to get to know people like you with similar interests via our blogs. We had a swing on the front porch, but it seemed to always be too hot or too cold to sit there. I enjoyed seeing this photo. The patio furniture looks uncomfortable. I wish that we had a porch to put a swing on – though your comment makes me realize that I might not actually use a swing very often even it I had one. 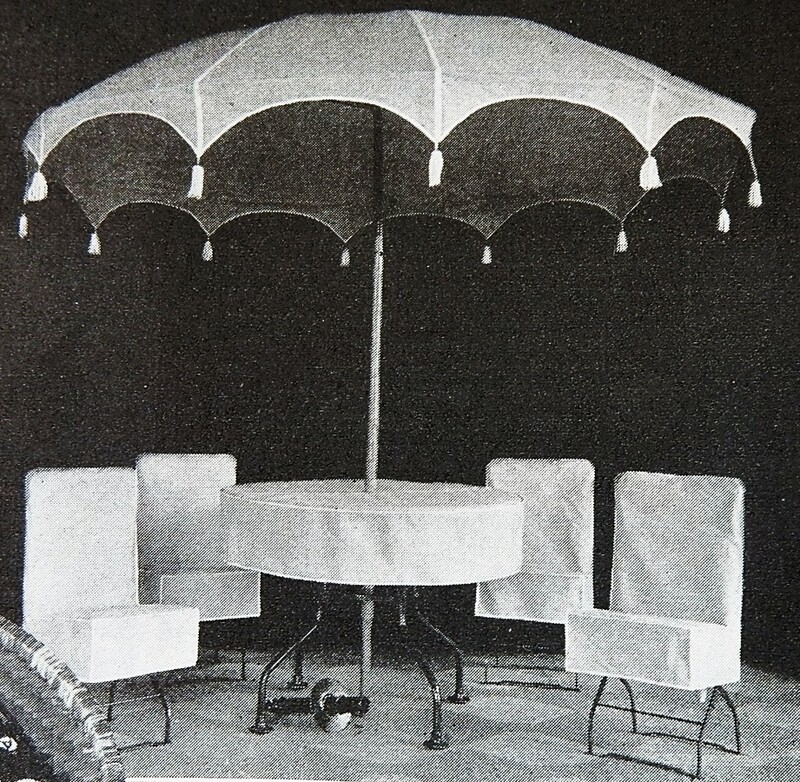 I wonder if they really spent much time outdoors, since it wasn’t until the 30s that Coco Chanel “invented” suntan chic 🙂 I agree with Anne, the chairs look uninviting. That being said, I had no porch or patio or deck while growing up, and spent all my time reading on my bed nestled in the corner of my room with both windows open for “nature.” So now I am making up for lost time here in my 1900 house, making outdoor life the center of my little universe! (And I rummage yard sales and even junk shops for “decor.” Shabby chic for me! I have similar memories of reading with the windows open and a lovely breeze flowing through the room. I still really like how open windows enable me to enjoy the season, and often have my windows wide open, while all of my neighbors have all their window closed and their air conditioners running. Shabby chic works for me. I like to say that my decorating style is eclectic. I agree – this has been a fun comment string. So do I. There’s something inherently relaxing about most outdoor spaces. I like the umbrella top,with its tassels,but I’m happy with my padded rocker on my porch. Why is it that “stylish” furniture often isn’t very comfortable? Your balcony sounds lovely. It would be so much fun to have coffee on the balcony on lovely summer mornings.